Those waiting for the Android Lollipop update on the Samsung Galaxy S5 were in for some major good news yesterday. Samsung started to roll out the update to users of the Samsung Galaxy S5 SM-G900F receiving the Android Lollipop update in Poland around the former’s R&D facility. And pretty soon, the firmware got uploaded online as well, much to the delight of users worldwide. So if you’re and SM-G900F user and want flash Android Lollipop to your device, head over here. French Carrier Posts Schedule For Android Lollipop Update. For more good news today, French carrier SFR has released a schedule which gives potential update dates for the Samsung Galaxy S5 and the Samsung Galaxy Note 4. 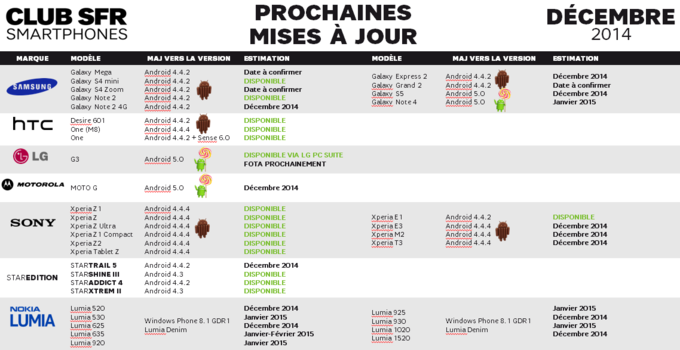 As can be seen in the image above, as expected, the Galaxy S5 can be expected to get the Lollipop update by the end of this December. The Samsung Galaxy Note 4 on the other hand is expected to get the update in January next year. Samsung has already started to roll out the Lollipop update in its homeland, Korea as well. This means that things about the Android Lollipop update are going according to plan over at Samsung, as the manufacturer had already promised Android Lollipop’s release on the Galaxy S5 by the start of this month. If everything goes smoothly, folks herein the US can expect Android Lollipop to become available on their phones by the end of December. Android Lollipop comes with a host of improved features on board, which end up adding improved functionality for privacy, performance, battery life, security and data sharing between different Android devices. It also comes with improved aesthetics in the form of Google’s Material Design, which ends up giving the software a much more neater and minimalistic look. So it isn’t long before Galaxy S5 users can experience this on their devices as well. So stay tuned.